Diyas and lamps are some of the common things Indian use during weddings, pujas and festivals. 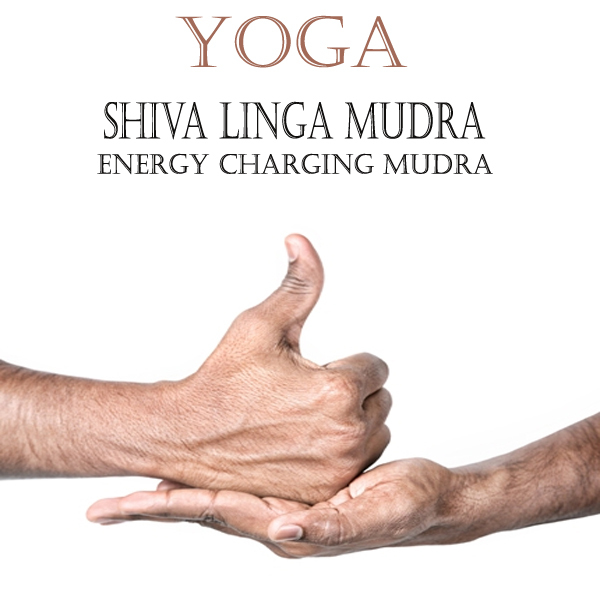 They are significant and are an important part of Hindu culture and traditions. While making Rangolis, diyas have always been used and the best part about them is that they make your design look bright, exciting and very lively. 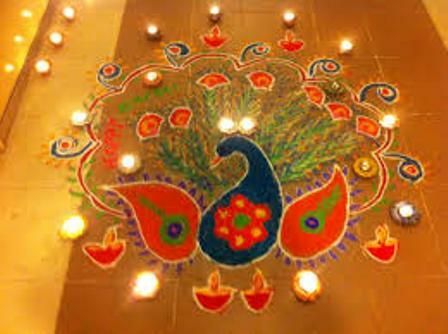 If you are looking for some Rangoli designs in which you can use diyas, we have enlisted some of the best ones just for your benefit and convenience. 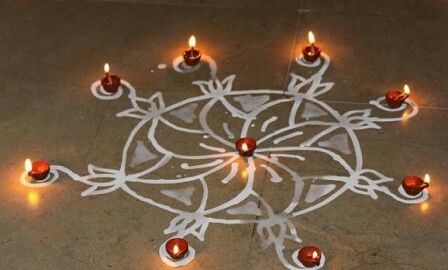 A simple Diya Rangoli design shall be suitable if you are planning to make a small Rangoli just for your house. You can use white paint or chalk for this and take the liberty of painting some amazing designs and patterns. 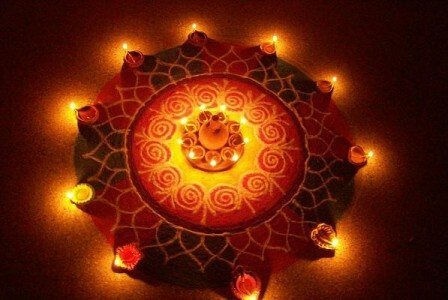 Place diyas at the end of every pattern and you shall be amazed at how great it looks. The stylish Diya Rangoli design is all you need to make your Rangoli look glamorous and fancy. 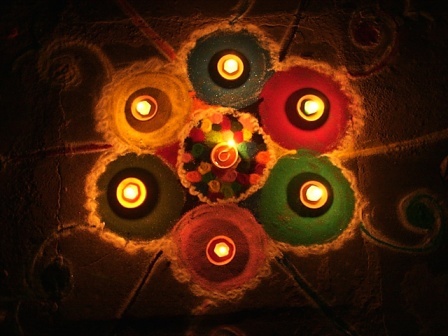 Make a design out of simple colors and place diyas in every corer. You can also place an idol of Lord Ganesh in the center. Such a design is bound to look spectacular in the dark. 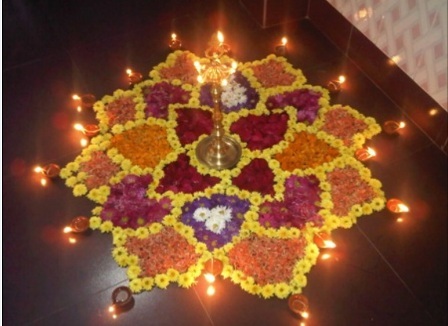 A special Rangoli design using diyas can be the one which uses pretty looking floral patterns. You can make the same design and shape several times and place a wonderful lamp stand in the center. Red, white, yellow and orange are the common colors used. You can use others if you please. 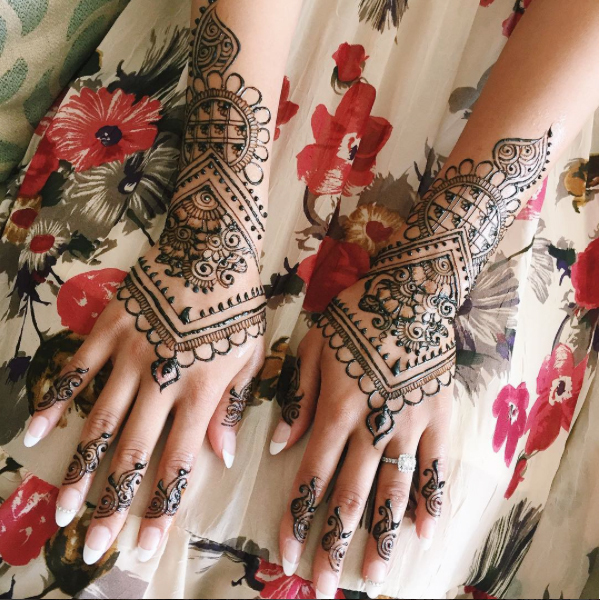 Even though triangles are typical shapes using while creating Rangoli designs, you can still use them in several ways to make it look attractive and beautiful. Use wonderful and illustrious colors and place the diyas in such a way that look pretty from a distance. This design will look great at night. You can easily create a unique Rangoli design by using elements and colors. Just make sure that the position of the diyas is suitable and that every corner and area has been filled with deep colors very well. You can make a floral pattern if you like or you can choose from the different designs available. 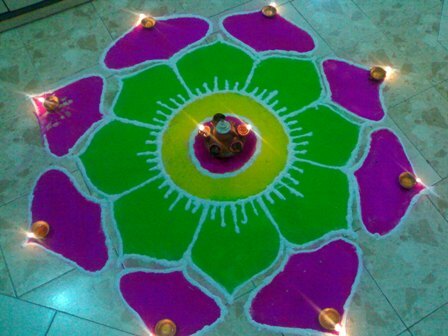 You can make your Rangoli design look different compared to others by using squares instead of typical circular shapes. Use colors such as green and black and make a wonderful design using the color red. Surround it with diyas and your square Diya Rangoli design shall be complete. 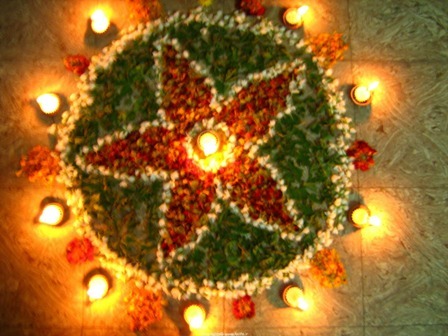 A star shaped Rangoli design surrounded with diyas is truly wonderful and picturesque to look at. You can use flower petals or plain colors for this one, however it is best to use petals as they look more natural and elegant in appearance. 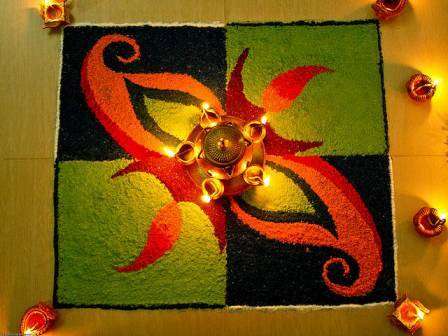 To make a spectacular Rangoli design using diyas simply create a green flower and place diyas in the center. Add purple petals to the border in order to highlight its beauty. 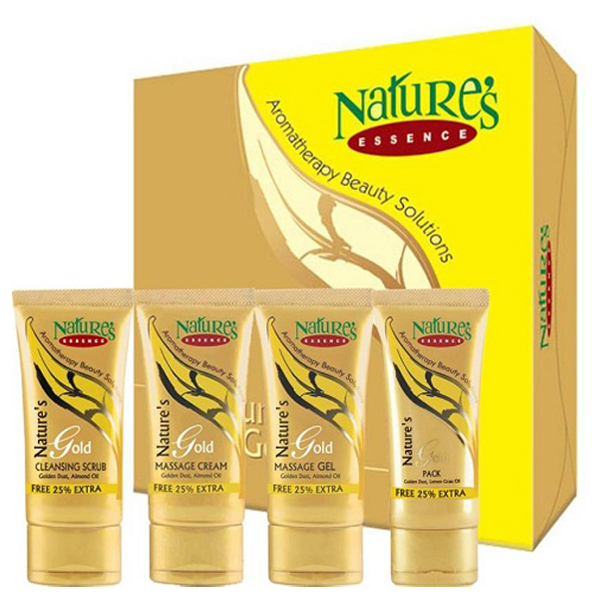 This one shall look very special and significant if it has been made with the help of a professional. The peacock Diya Rangoli Design is truly the best one seen till date. It looks very attractive and has a very extravagant appearance. You can simply create a peacock, create the shapes of its feathers with pretty colors and surround it with illuminating lamps and diyas. 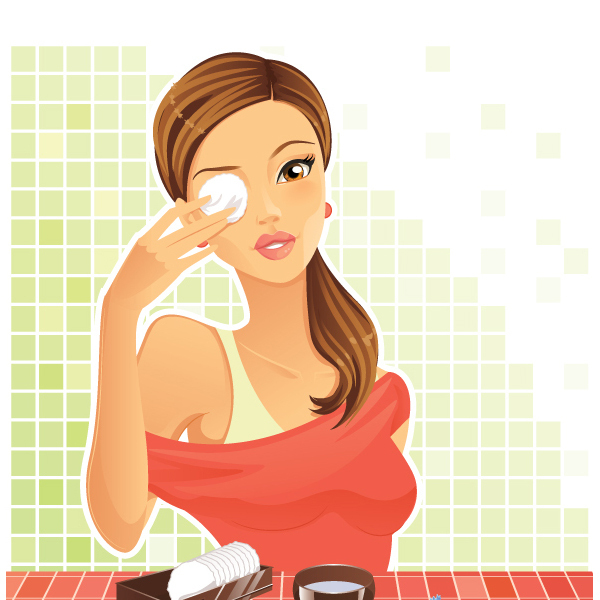 Your design shall be widely appreciated for sure. 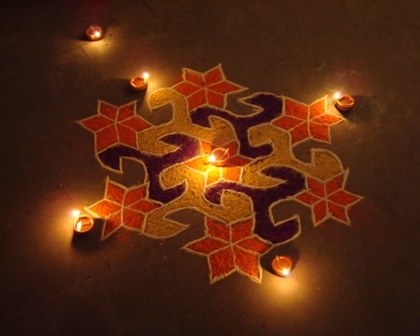 ← Previous Story How to Draw a Rangoli Designs?